Hello Kindred friends! 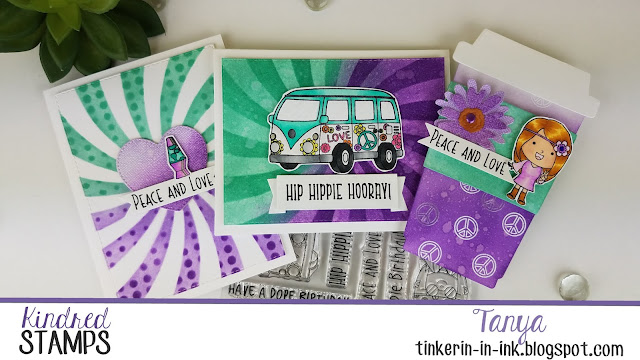 It is time for the April Release from Kindred Stamps, and I get to be groovy with you all! I know I say this every time, but I really did have so much fun playing with this set. I love it! 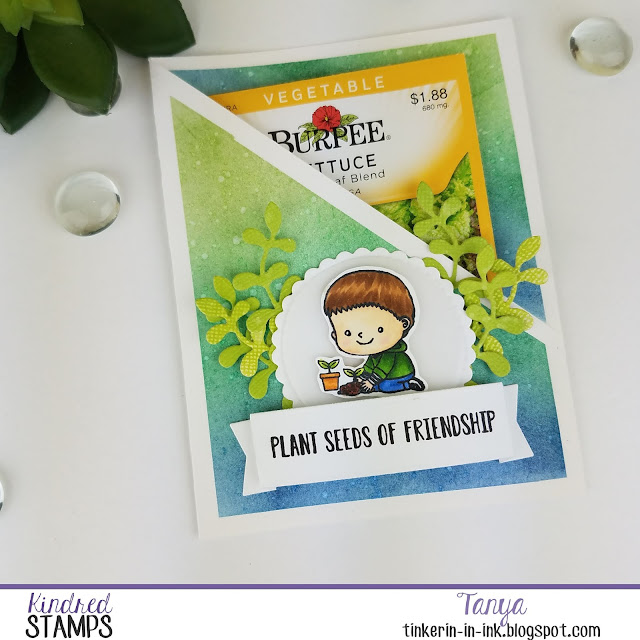 My first project was this cup shaped card using the Honey Bee coffee cup card die, which just happened to arrive the same week at this stamp set. I did a bunch of sponging, spritzing with Pearlized water, and spattering with clear water. Then I heat embossed the peace sign in White Satin Pearl and White embossing powder. I think they look like bubbles. The belly band slides off, and has most of the embellishments on it. 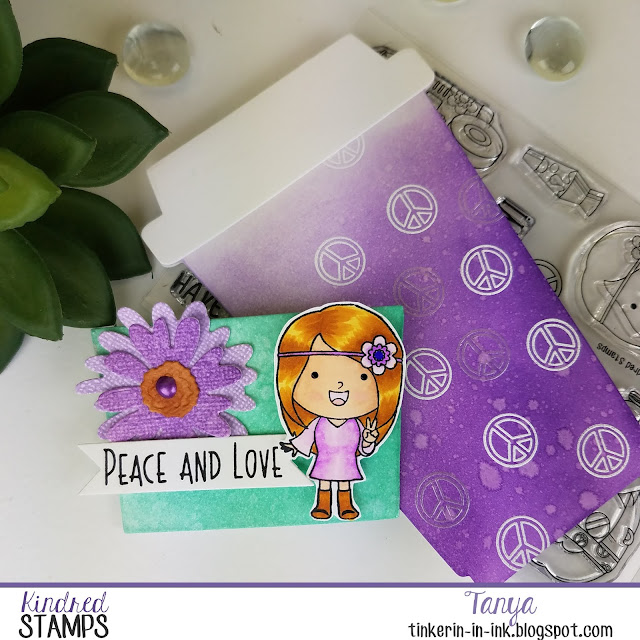 The flowers are sponged and diecut with Spellbinders Layered Colorful Blooms dies and Nuvo Drops in Galaxy Violet. The hippie girl is colored with Copics, and I wrote them all down. But that list is at home, and I am in Florida. Just got off a cruise ship... I will have to add that info when I get home. On Tuesday! 😏 Prepared, aren't I?! Even the inside got some sponge and spritz love! 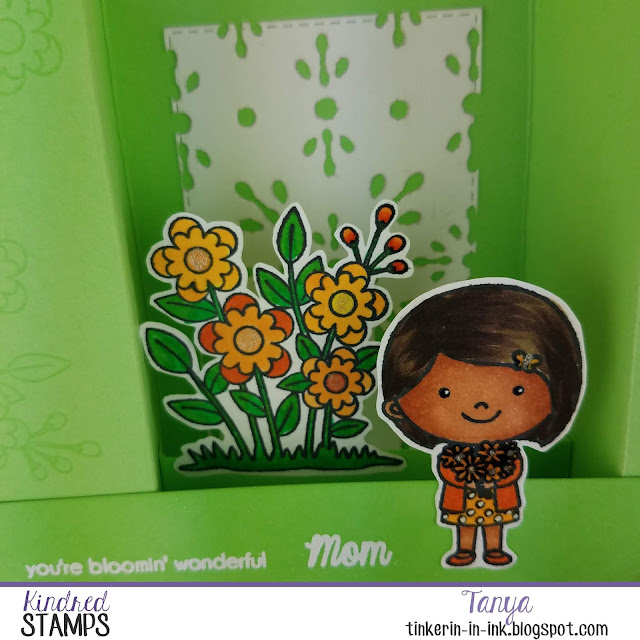 The sentiment is from this stamp set also. 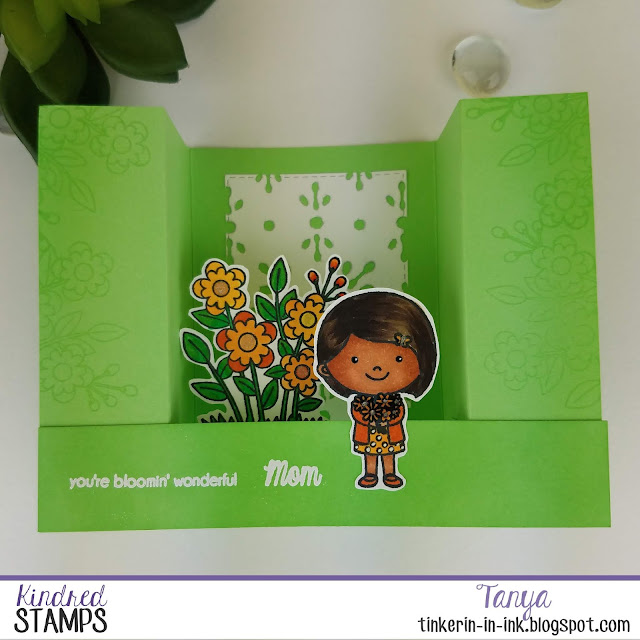 The top portion of the card has a diecut panel with insert tabs for a gift card. Next I had to play with this awesome VW van. I love all the graffiti on it! The Swirl stencil was the perfect background accent here because the bus is pretty big and makes for a quick cardfront. Ok, I am really, really happy with the way all of these projects, but this is my favorite. At least for how the techniques and how quickly the idea gelled and came to life. I did a double stencil technique. First with the Swirl stencil, then with the Comic Dot stencil, without removing the Swirl stencil. LOVE!! I colored the lava lamp with Copics, list to come later. I also used the Sakura Gelly Roll Glaze Clear and Stardust pens. I used mostly the same colors for everything, to keep things simple. And because I actually really love this color combo! It is a new one for me. OK, that is the last of my projects for this post. Enjoy the rest of the release! The entire Kindred Stamps April release will be available Friday, April 26th at 8am PST/11am EST. 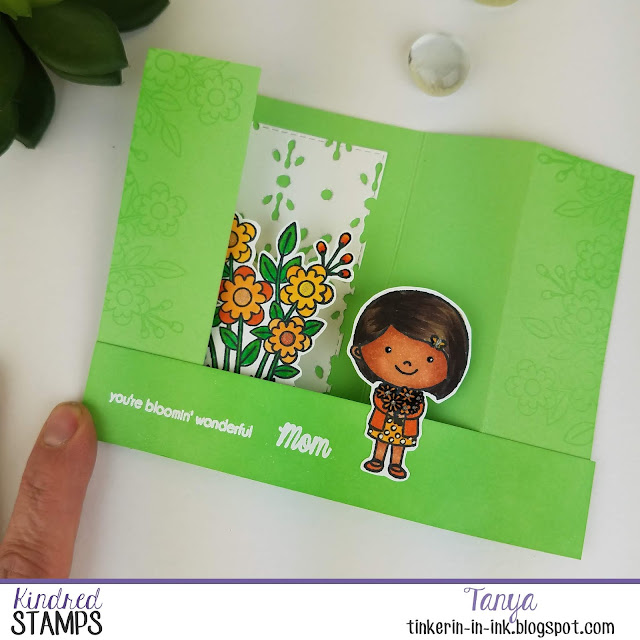 Be sure to subscribe to the Kindred Stamps blog to see a daily line up of sneak peeks from our amazing Design Team and see the full product release on Friday! 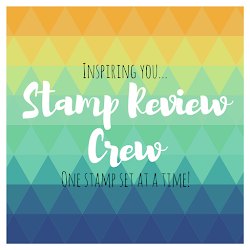 Come join the Fan Club and release event to be part of the release fun, and you may just win some Kindred Stamps credit!! 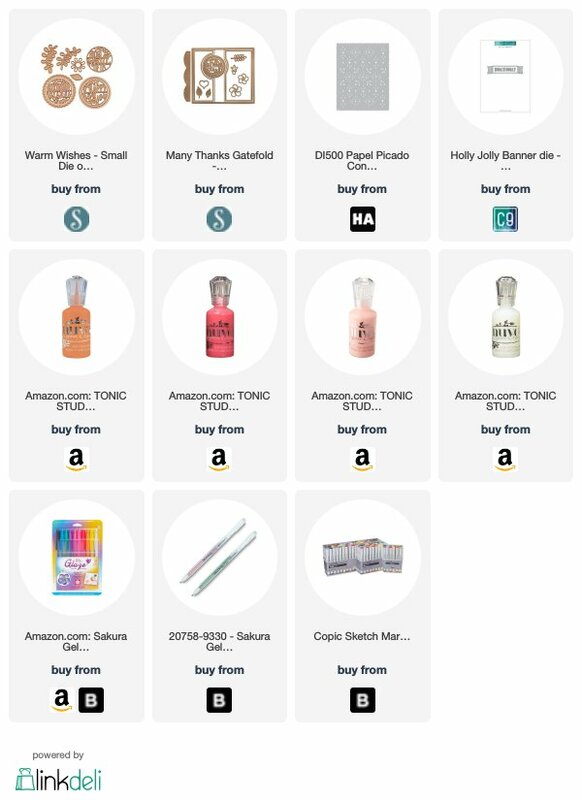 Some of the supplies listed below are affiliate links, some are not. If you use an affiliate link here to make a purchase, I may get a small compensation. I only use things that I love, and do not create paid posts. Who doesn't love a cheesy joke?! 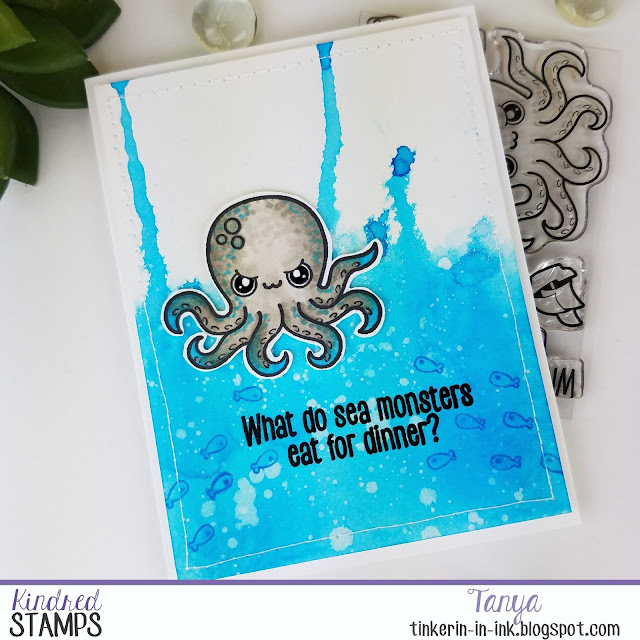 Mythical Kraken is full of punny fun! This set is in Last Chance mode folks. You want to be sure to get yours while they last! It was one of the first sets I got, and I have to confess that I had not played with it before now. Shame upon I! It is so stinkin' cute!! 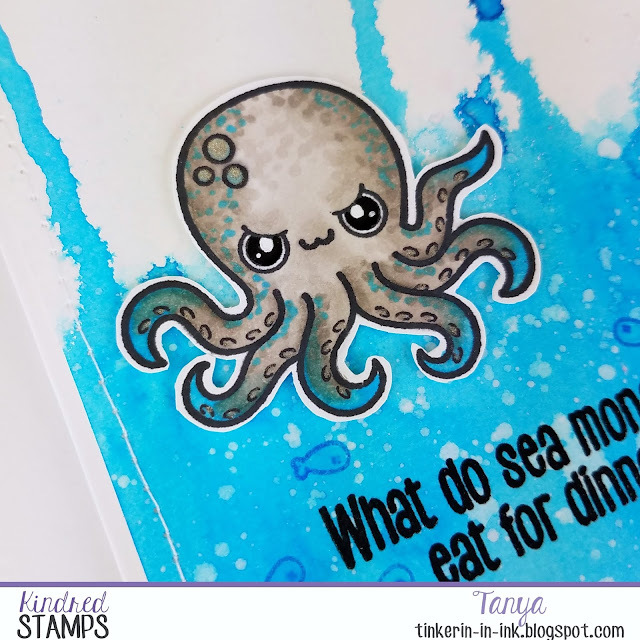 The background was a turquoise dye ink, blended into a piece of watercolor paper, then spritzed with Pearlized water and allowed to drip down the panel and dried with a heat tool. Then spattered with water. The sentiment was stamped in Versafine Onyx Black ink, then clear heat embossed. 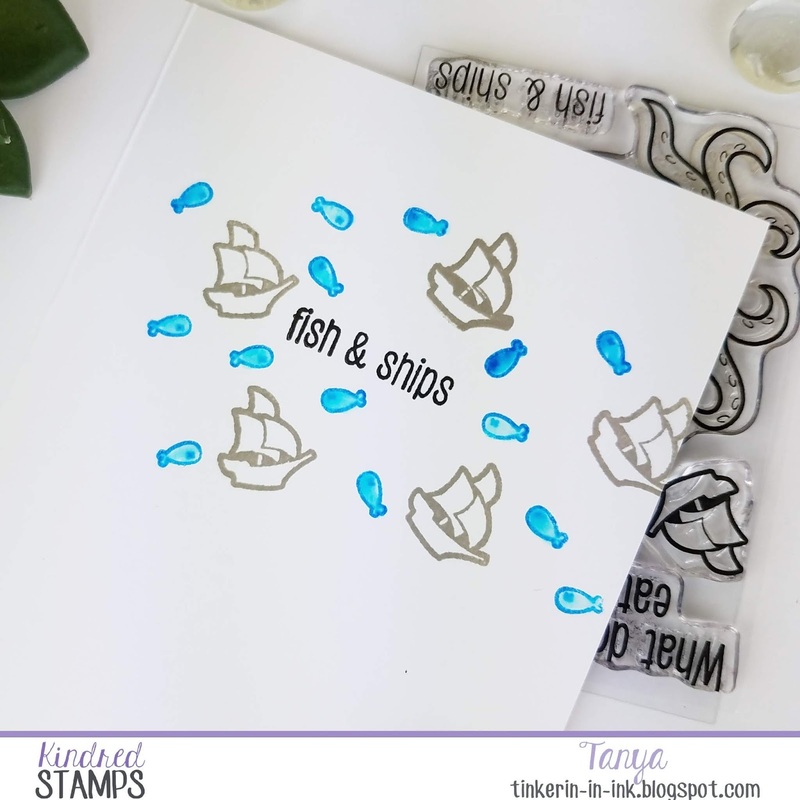 And a bunch of fish were stamped in the same turquoise ink, then a Clear Sakura Gelly Roll Glaze pen over top to a little shine and dimension. And the punch line on the inside! I had to scatter fish and ships all around it. The fish are stamped with the same turquoise ink, then a blender pen is used to color them in. I went over them with the same Sakura Gelly Roll Glaze pen in clear. For a little set, this one really is loaded with goodness! I love the "I am a sucker for you" pun with the tentacles!! When I started this tag, I was going to color each individual tentacle. 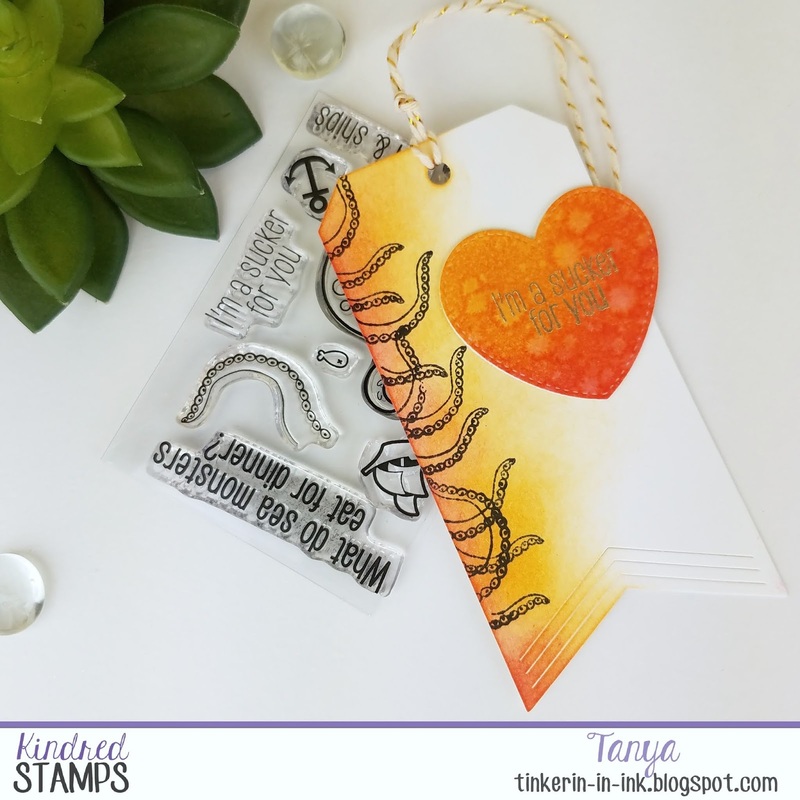 But changed my mind when I was sponging the cardstock for the heart. This still looks awesome, but took a fraction of the time. Plus, there is no bleed through like there would have been with Copics. The sentiment is Brass heat embossed on the sponged and spritzed cardstock. It is easier to see in real life, but not much. Maybe white would have been better. What do you think? So, are we ready to make this set fly off the shelves? I know I am glad it is in my stash! The background is the Mosaic Turnabout stamp from Concord and 9th. 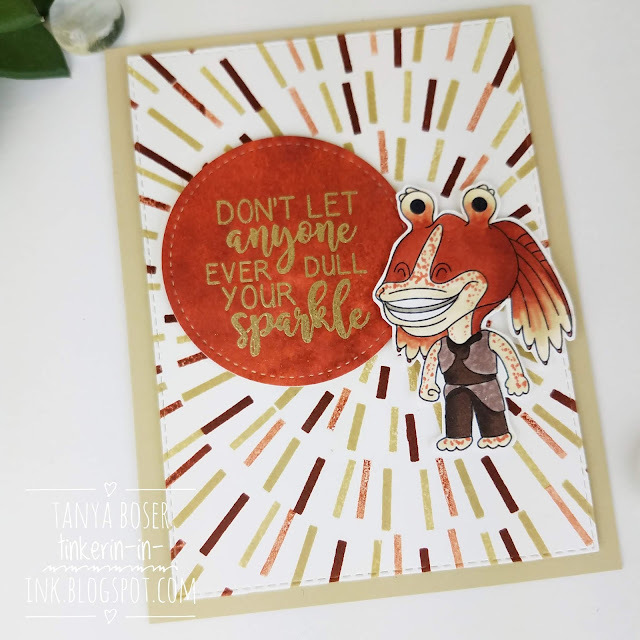 I managed to sneak one of my favorite neutrals ever into this card: River Rock. It is a retired color from Stampin' Up!, but I have a stockpile of cardstock and ink refills. 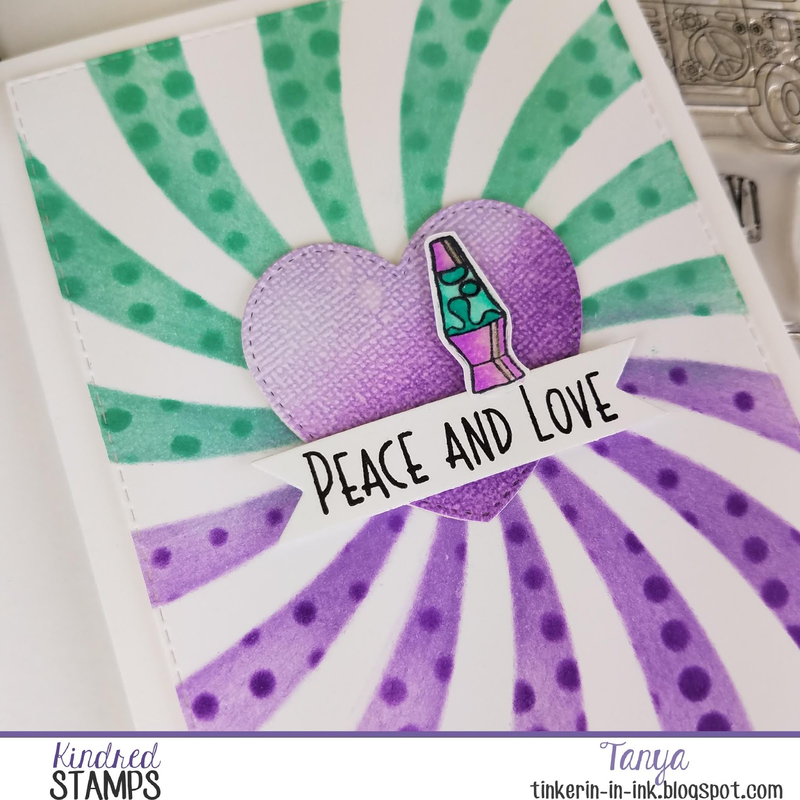 The sentiment is from a retired Kindred Stamps set called United We Stand. Are you ready to go get yours? 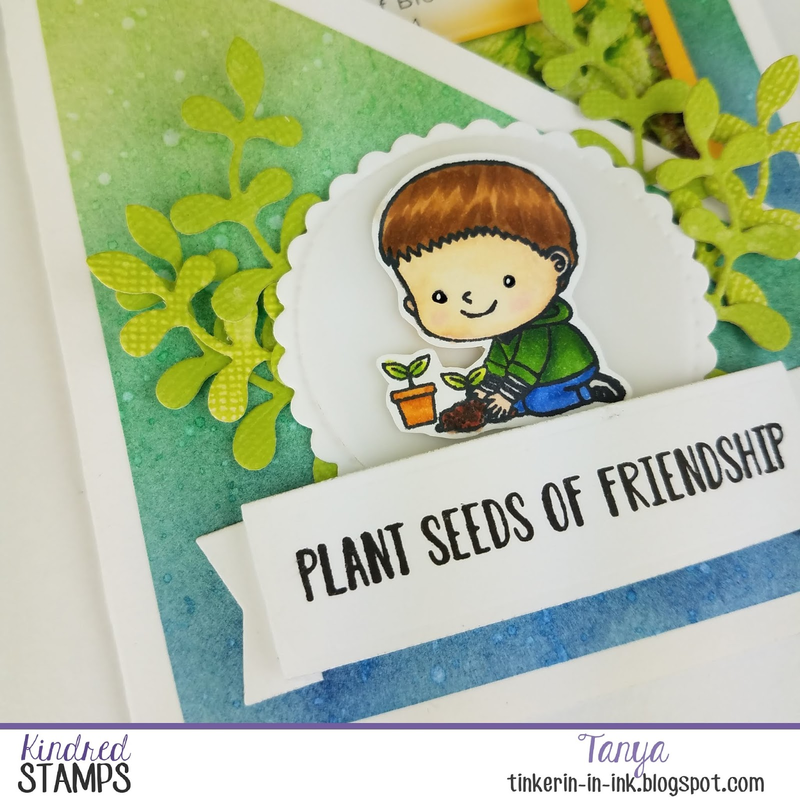 Let's see what you create, and don't forget to share it over on the Kindred Stamps Fan Club page on Facebook! 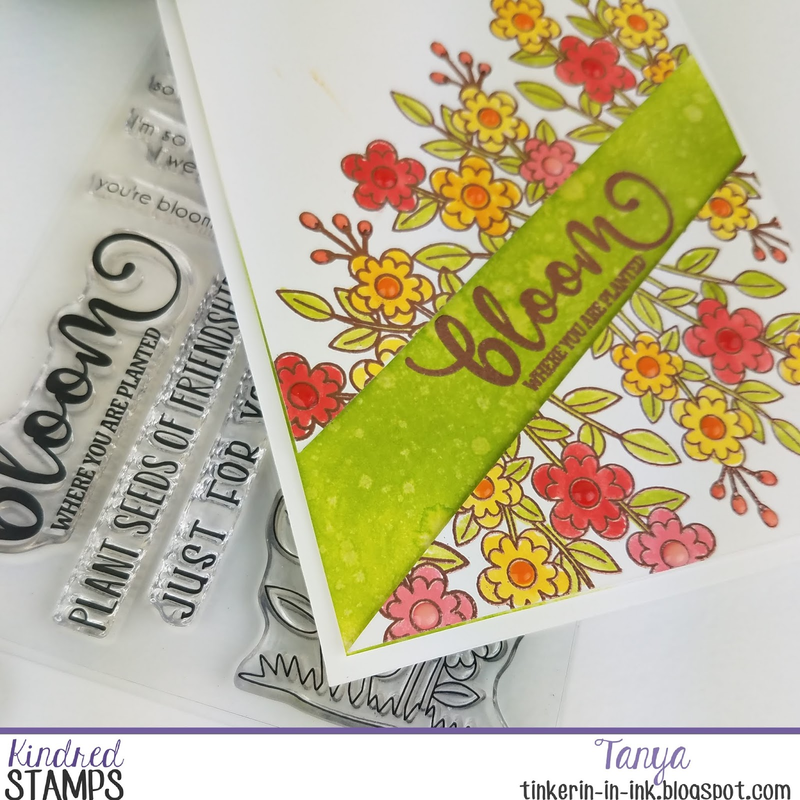 We need spring, and Audra is delivering with the new Bloom stamp set! I got to feature this set during the recent release, but I could not stop playing with it. 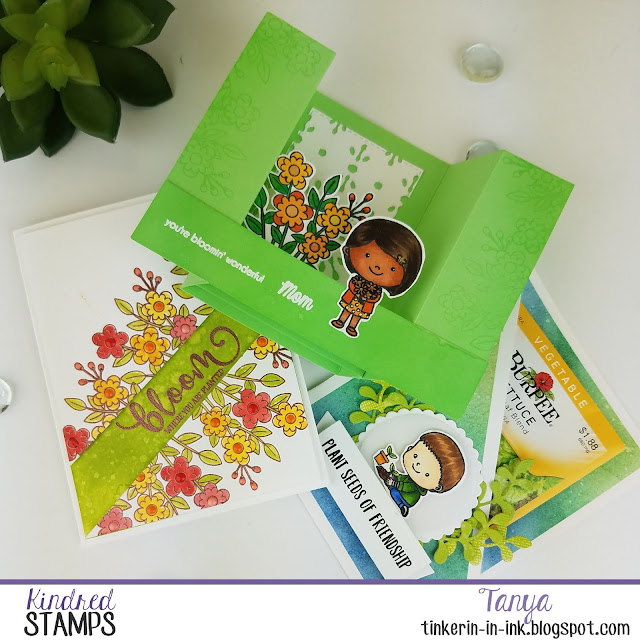 The kids are adorable, the sentiments are sweet, and the flowers are fun andeasy to color. What more could you ask for?! For this sweet little girl, I chose the colors from the pattern paper. The sentiment strip was colored with a Copic marker from the color palette for the girl. 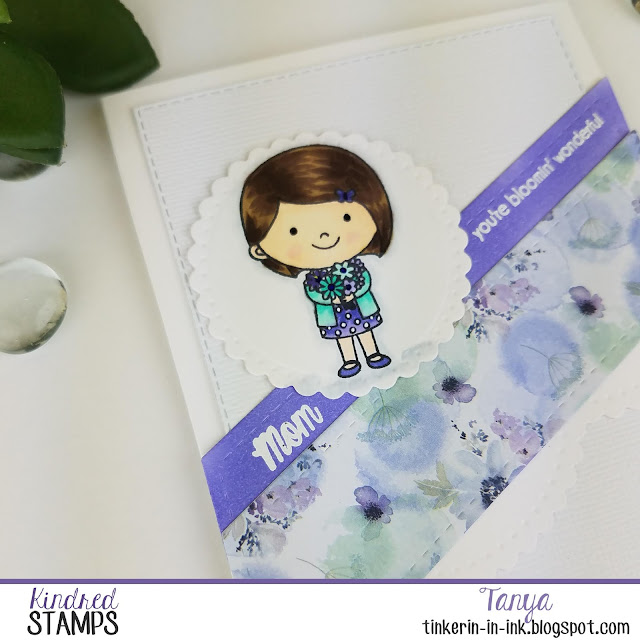 There is a very pale gray outline around the girl to add a little dimension and the flower centers are dotted with a Sakura gelly roll glaze pen in purple. The sentiment is wait heat embossed. I could not resist that sentiment, it is hilarious. I'm not even sure what location I would use it for but I'm going to find one! 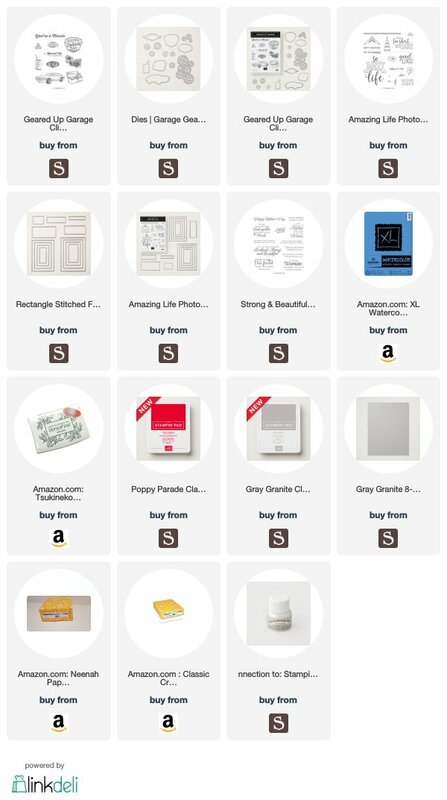 I started by dry embossing a large polkadot pattern on a piece of Bazzill white card stock. 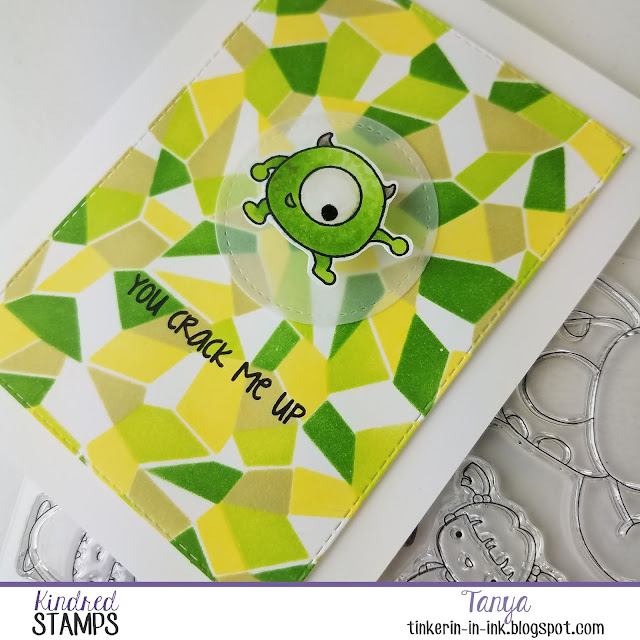 Then I sponged a green ink on a light blue card stock with the Comic Dots stencil. Then I cut this out with a stitched circle die. I cut a smaller vellum stitched circle also. 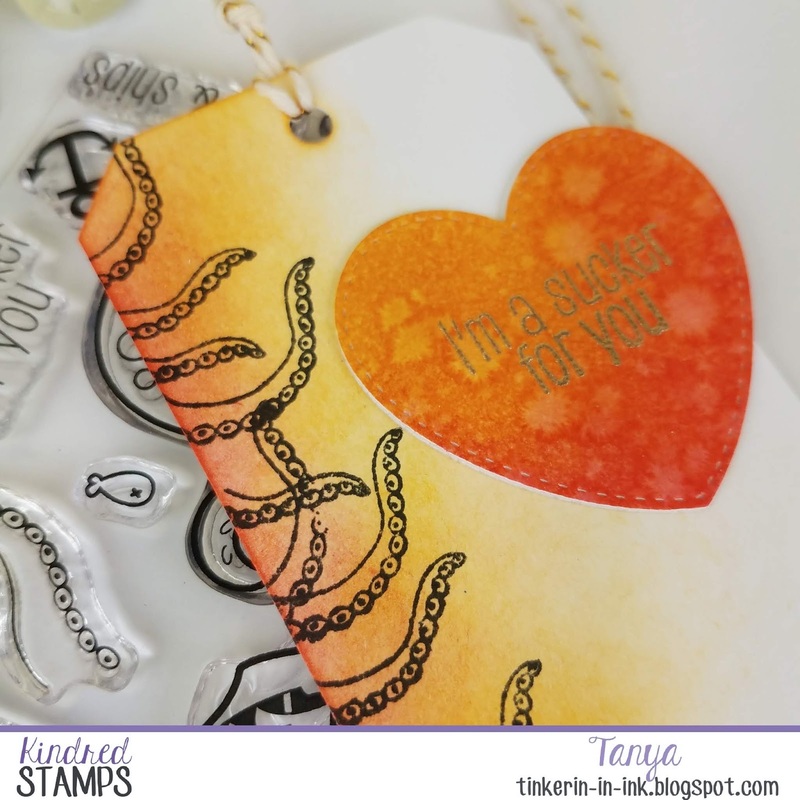 The sentiment strip was colored with a Copic marker, stamped in Versafine Onyx Black ink, and die cut with a stitched rectangle die. I did add stripes to the dress and dots to the boots with a white gel pen. 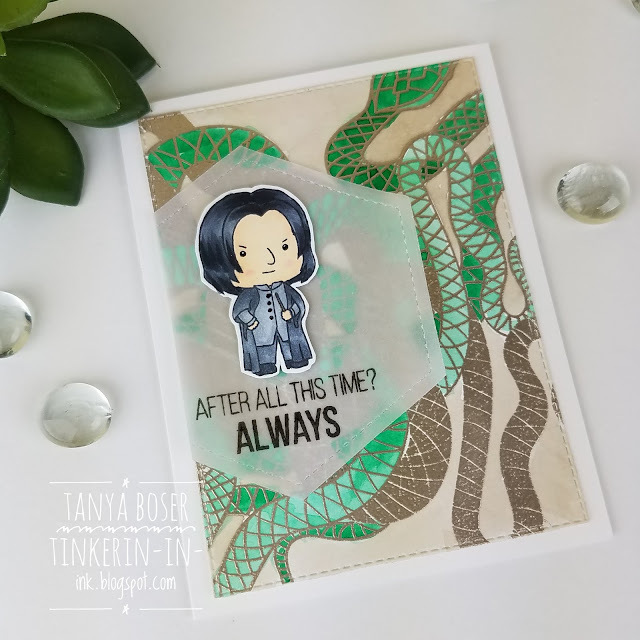 This finishes up the projects I created with the stamp set this month, but I'm sure I'll find more in the near future. Thanks for stopping by, see you next time! I think we are due for some fun fantasy themed cards, and I have been thinking about making some magical themed cards for a while. I even bought a few supplies with this theme in mind! This particular character is one of my daughter-in-law's favorite, and with this background stamp practically burning a hole in my pocket, I had to start with this one. 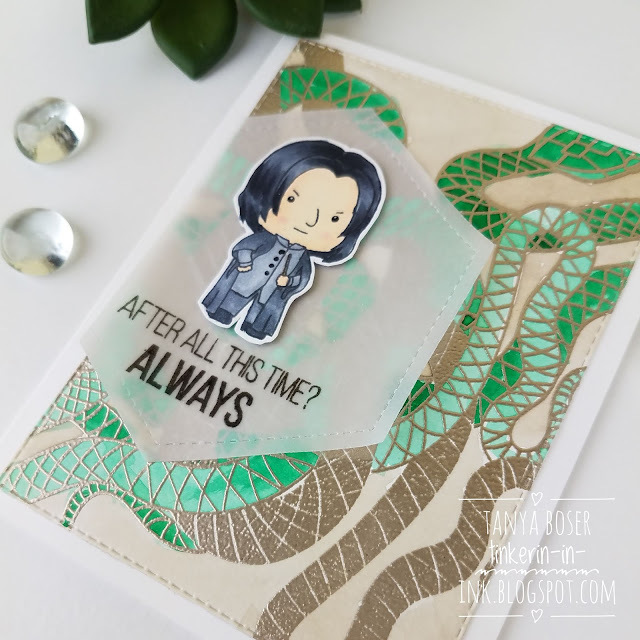 The background is silver heat embossed on watercolor paper, then watercolored with Shaded Spruce and Gray Granite ink. The sentiment is stamped with Versafine Onyx Black ink and clear heat embossed. I created a video showing the whole process! Please remember to go to my YouTube channel and subscribe so you don't miss any of my new videos. 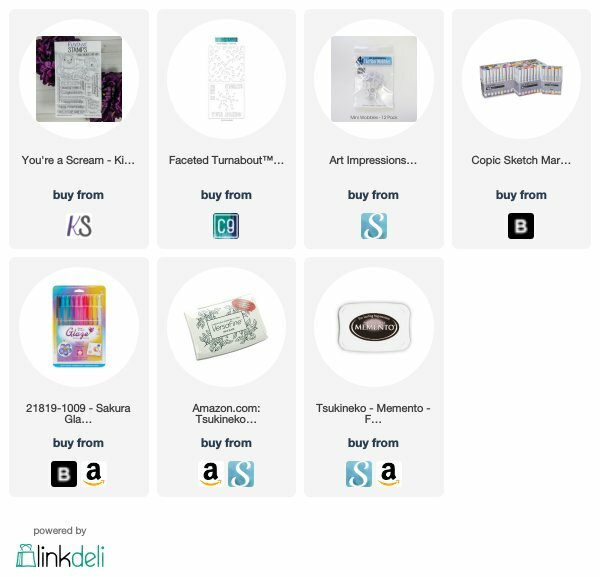 Here is a clickable list of the supplies I used. 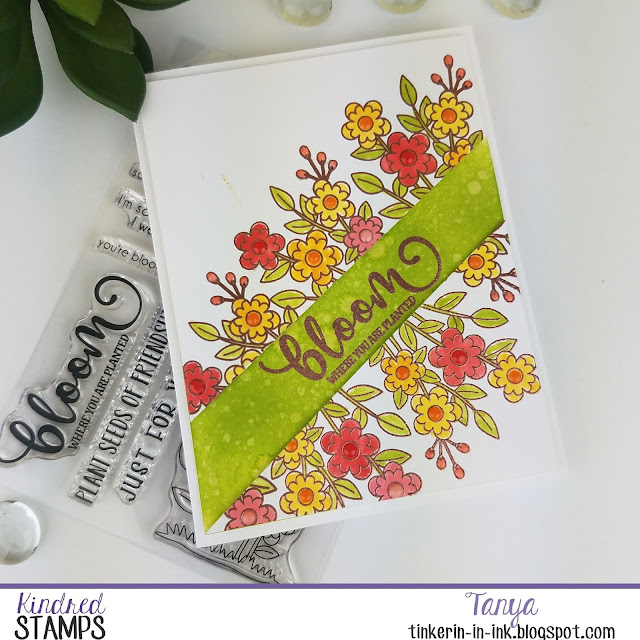 Today I get to show off the fresh and fabulous Bloom stamp set from Kindred Stamps. It releases on Friday, March 22. The stamps in this set are not pop culture related, but t they are still adorable! And so very spring. I could not wait to play with them! This project is a bright bridge card. 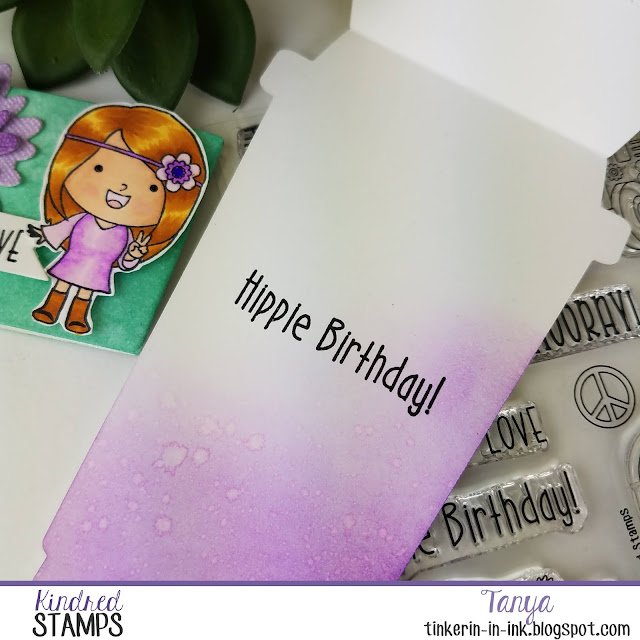 I used a super simple fancy fold, perfect for a beginning stamper, and just as fun for a seasoned stamper. Part of the magic of this fold is that it lays flat and fits in an A2 envelope, perfect for mailing without a lot of bulk! I was feeling the orange this time, and kept my color palette pretty simple. 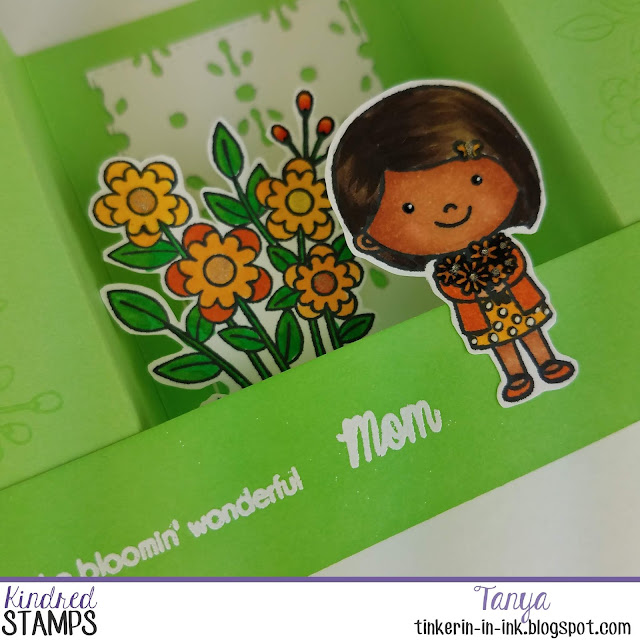 The images are all colored in shades of yellow and orange with Copic markers, and our little girl is a brown that could represent many ethnic groups. The diecut background element really helps to highlight this very feminine card. The big floral bouquet is adhered to an extra internal bridge to add even more depth and detail to this card. 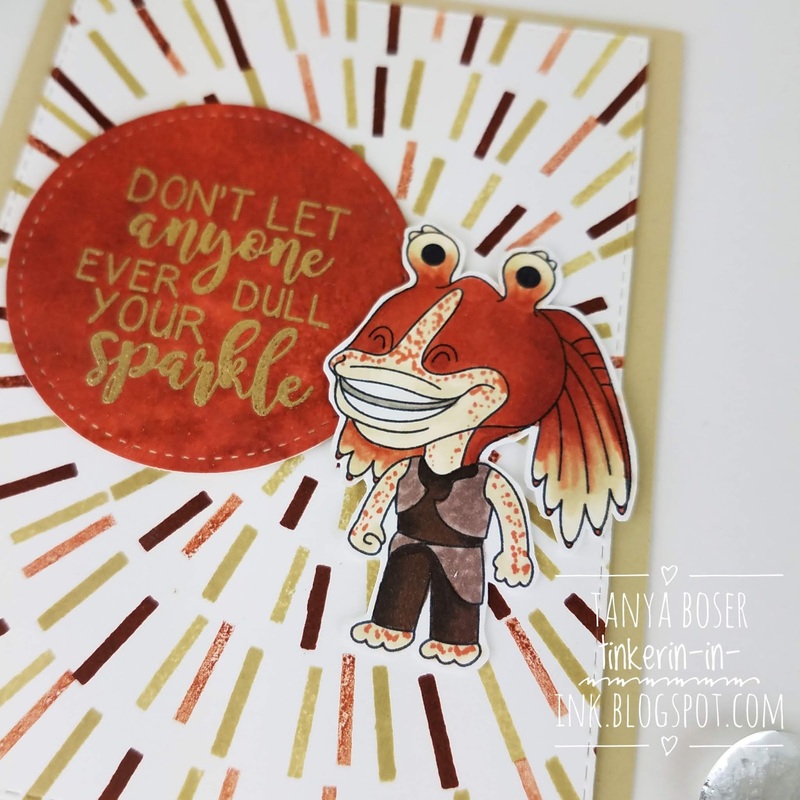 My next projects was done on Neenah Solar White #110 cardstock because it can handle very light watercoloring and is that lovely bright white. I actually did all the cutting first, then the inking and coloring. 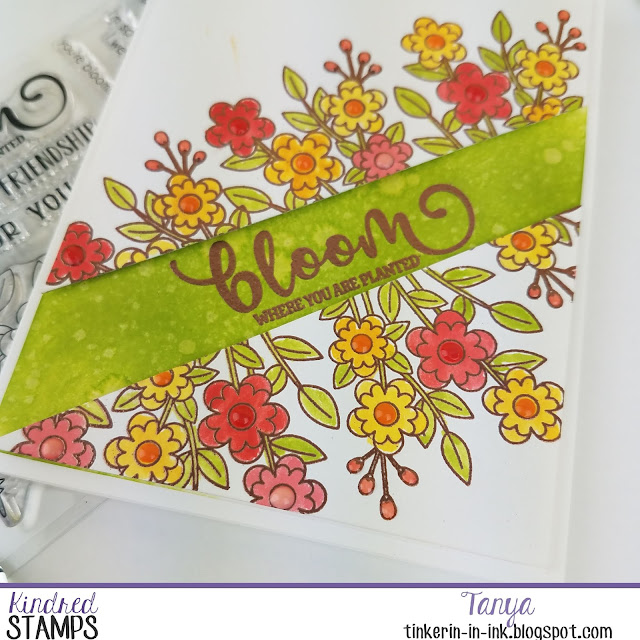 The flowers are stamped in Versamark clear embossing ink, then they are Copper heat embossed. I used ink squished onto a nonporous surface (the lid of the inkpad in this case), and a watercolor brush to color all of the flowers. Here is a list of the stuff I used. This may be my favorite of the projects. I took a piece of construction paper that my grandchildren had finished playing with, and created a packet to hold seeds. This is the same size as an A2 card so it could fit in a standard envelope. I used washi tape to mask off a uniform at border around the front and just the triangle for the inside. Then I sponge do with three colors of ink and blended with an ink blending tool. These areas were then spritzed with water and spattered. I used liquid glue to adhere the front to the back along the right hand and lower edge to create a pocket. The leaves and the circle dies our from spellbinders small diet the month kit and large diet of the month kits from December 2018. The banner is from Concord and 9th's Holly Jolly banner die. 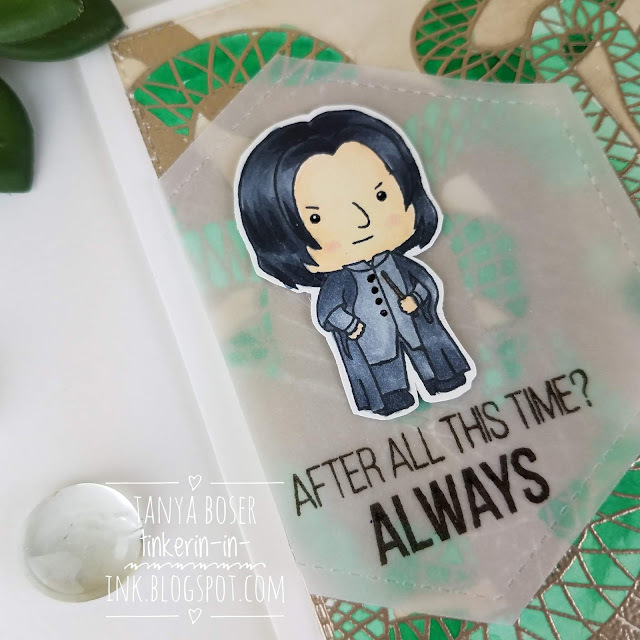 The sentiment on the banner is stamped with Versafine onyx black ink. 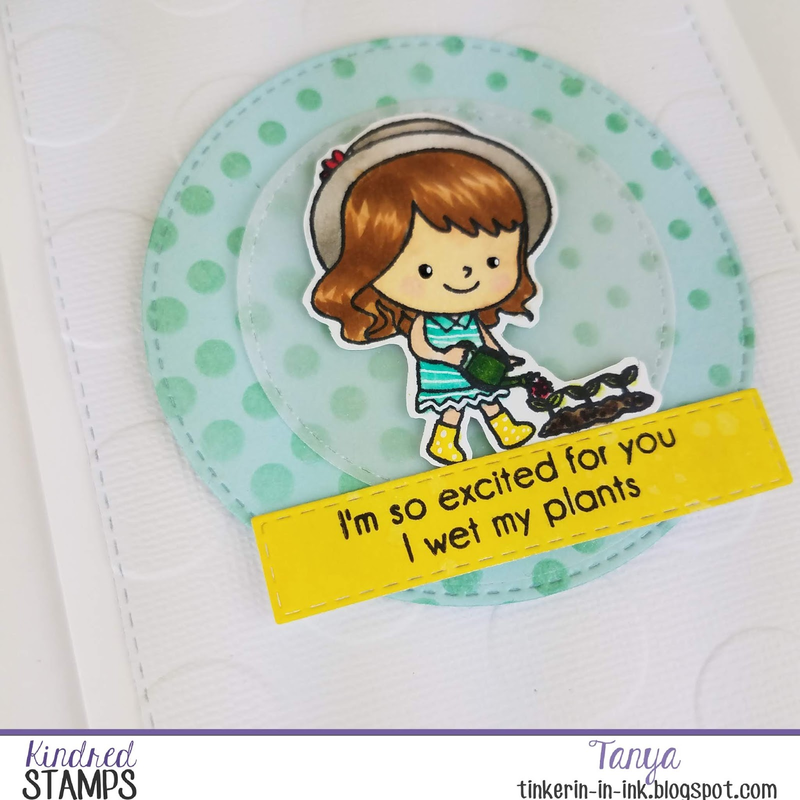 That's all I have for right now but I already have several other projects created to share with this stamp set. Look for those soon! 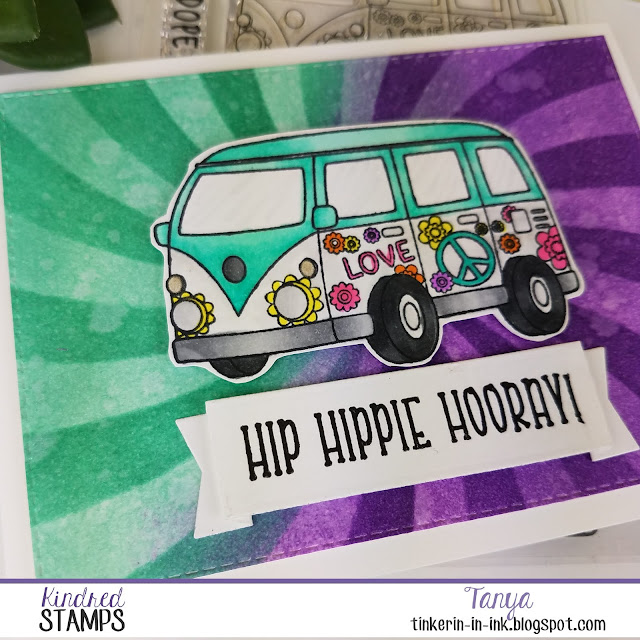 The entire Kindred Stamps March release will be available Friday, March 22nd at 8am PST/11am EST. 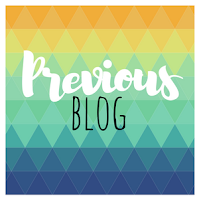 Be sure to check out the Kindred Stamps blog on Friday for the full product release as well as the complete line up of all the Kindred Stamps Design Team projects from release week! 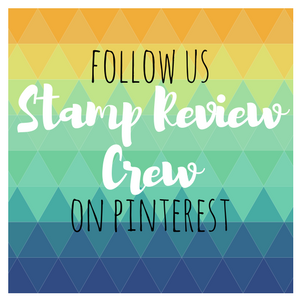 If you visit and comment on all of the designers' blogs this week, you could win $15 in Kindred Stamps shop credit! So join the Fan Club and release event, show the design team some love, and get ready to empty those wallets this Friday! 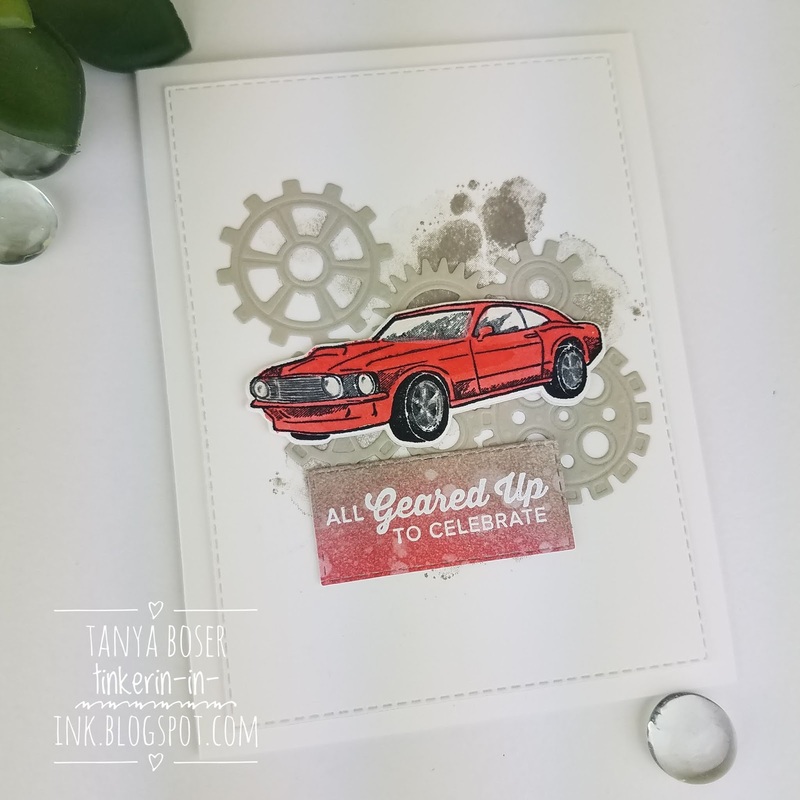 Muscle cars, gears and grease, and all things automotive coming your way! 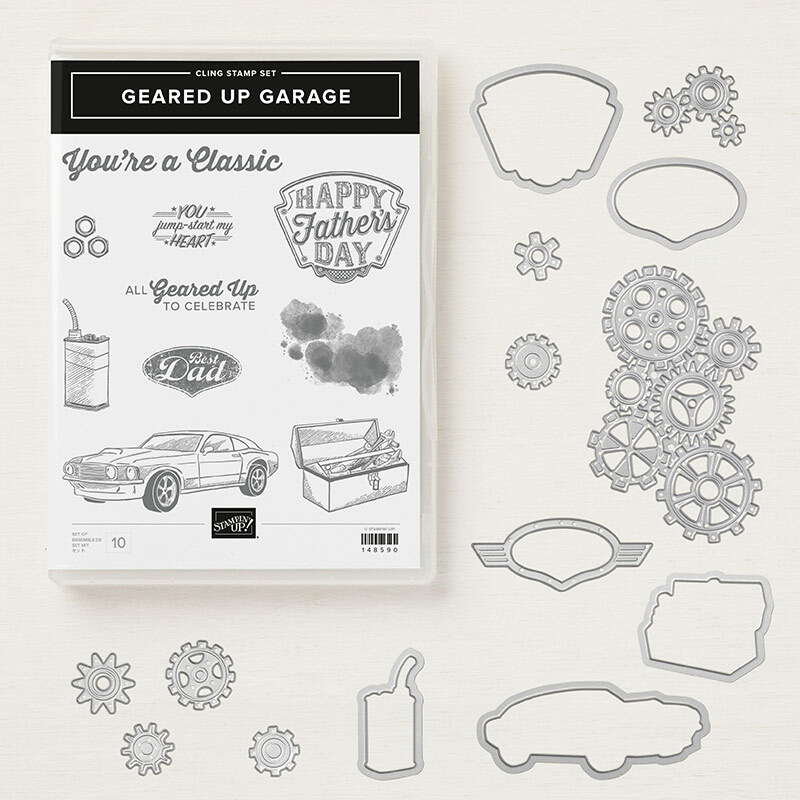 We are featuring Geared Up Garage this time. I like a sporty looking car, I'm not ready to be boring. And I know a lot of people that feel the same way. You don't have to be a guy to enjoy this set. But it is awesome for masculine cars! OK, time to start seeing the inspiration! 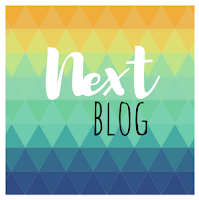 If you are following along in order, then you have just arrived from Stesha Bloodhart's blog. Isn't she amazing?! 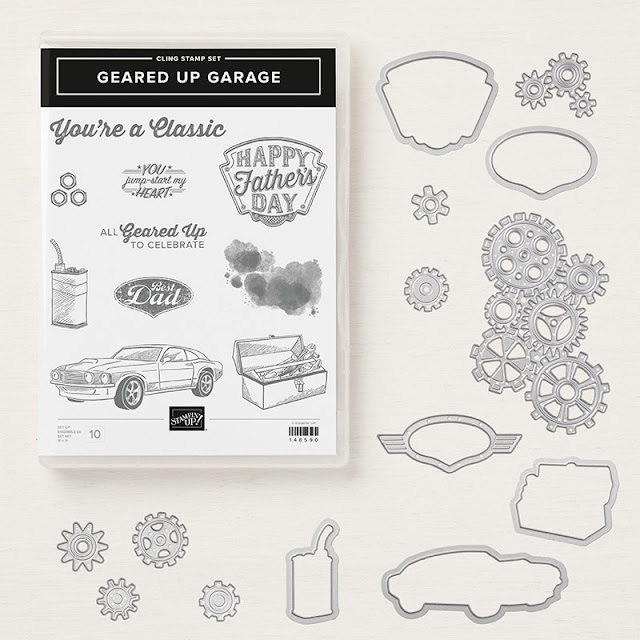 I stamped the splotchy image in Grey Granite a few times and glued the gears over it. 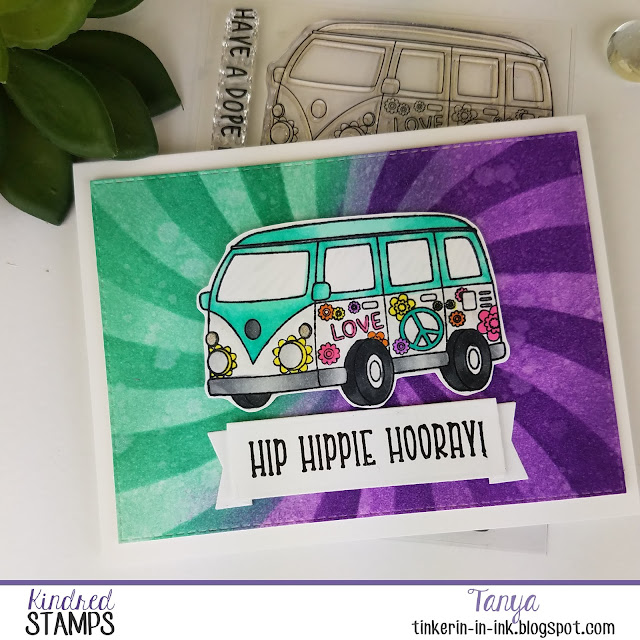 The car is stamped is Versafine Onyx Black on watercolor, then watercolored with Poppy Parade ink and silver and frost white shimmer paint. 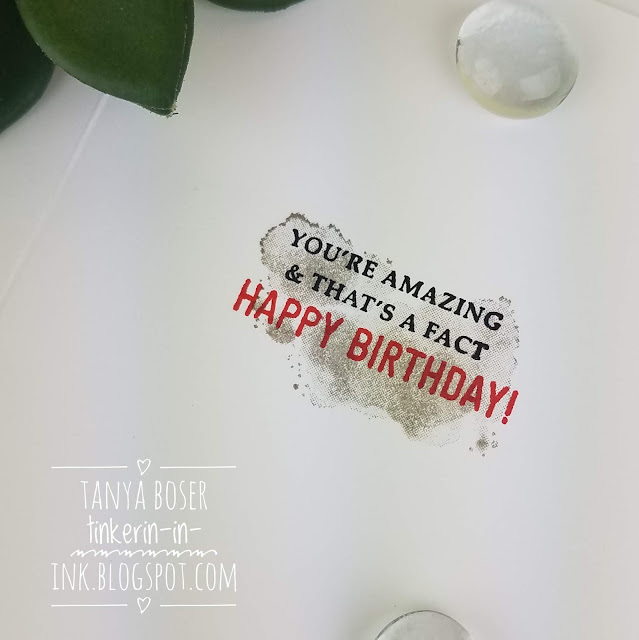 The sentiment is white heat embossed on a piece of white cardstock sponged with Poppy Parade and Grey Granite, then spritzed. Inside, I stamped the splotchy image again, then stamped the sentiments from Strong and Beautiful and Amazing Life in black and Poppy Parade. 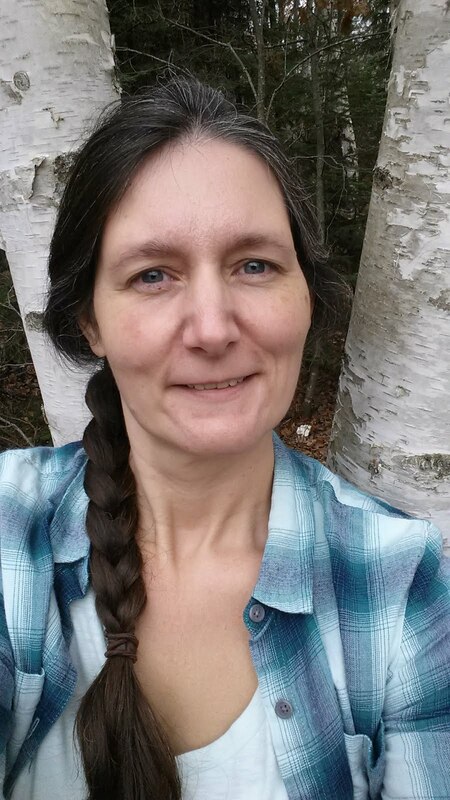 That's it for me, next up is Cindy Elam with her charming and beautiful creation!